Telescopes: How do I buy a telescope? So You Wanna Buy a Telescope for the Holidays. Here’s What You Should Do. 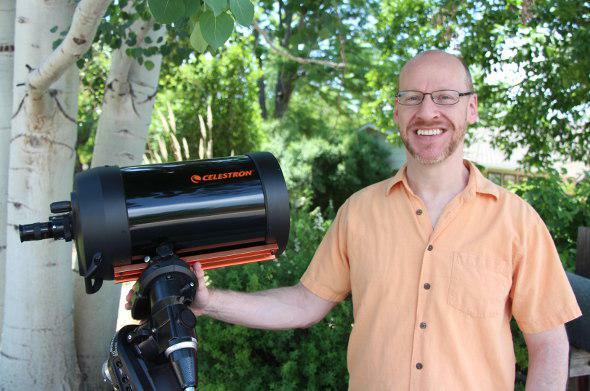 A man and his ‘scope: In this case, your host with his trusty Celestron 8”. Note: This is an updated version of a post I wrote years ago, now with better links. But the basic advice hasn’t changed, so hopefully this will help you in your search for a good telescope. The emails have already started this year. First off, let me say that I get so many of these emails that I created a Web page with telescope-buying advice. It’s from 1998 (the previous millennium! ), but the general advice there should still be true. Basically, buying a telescope is like buying a car. What you should get depends on what you need. If you only need a car to drive to the store for groceries, don’t get a Hummer. If you live in the mountains and it snows 10 meters a year, don’t get a VW Bug. ’Scopes are the same. If you want to do general observing, looking at big things like the Moon, open clusters of stars, and bright nebulae, then a small telescope will be fine. If you want to see planets in detail, or take deep astrophotographs, or go galaxy hunting, your needs will change. 1) Buy a pair of good binoculars first. They are extremely useful, show you wonderful things and can test your appetite for observing. They are an excellent tool for getting used to the sky and can be used during the day for bird spotting and other things, too. If the interest keeps up, then move on to a telescope. 2) I cannot stress this enough: find a local astronomy club and go to the meetings! At least attend star parties when they throw them. The best way to shop for a telescope is to let others show you theirs. At a good star party there might be two dozen or more telescopes of all different flavors, and you can see how easy or hard they are to set up, to use, and what they can show you. Amateur astronomers are only too happy as a whole to talk about equipment. This is absolutely the best way to gauge your level of potential involvement in astronomy. 3) And if you decide to take that fateful step and buy a telescope, avoid department store ‘scopes AT ALL COSTS. The overwhelming majority of these ‘scopes are cheap garbage with poor optics, bad eyepieces, and wobbly mounts. Instead of instilling a deep love for astronomy, these lemons will instead make it a frustrating and aggravating experience. You may be tempted by the beautiful pictures on the box and the claims of 200X magnification, but what you’re buying is a sure-fire way to grind someone’s enthusiasm into the ground. Update, Dec. 4, 2014: I purposely avoided pointing folks toward specific telescopes in this article for various reasons (mostly there are just far, far too many to list), but the good people at Astronomers Without Borders told me they have an inexpensive 13 cm starter ‘scope that actually looks quite nice. I have not used it, so I cannot personally endorse it (i.e. caveat emptor), but 1) AWB is a good group, and b) Sky and Telescope published an enthusiastic review of it. It’s only $200 (incl. shipping), which is pretty inexpensive… but it’s only available in the US. All profits go to AWB, so that’s cool, too. There are a lot of telescopes out there. Universe Today has many reviews of them. NBC News has some tips on what (and what not) to look for. Manufacturer Orion has some ‘scope-buying tips. ScopeReviews appears to have some good advice. … and, of course, there’s always Google. If you want to buy a ‘scope for someone this holiday, remember that you may be leading someone down the path of a lifelong and extremely wonderful pursuit. That first step is a doozy, so treat it with respect!